In this room of vulgar tastes, there was a bed with red covers, a cage with a chameleon instead, a large mirror with messy decorations; the room was giving off smoke, scattering a thin fragrance. It was a terrible scene. On the wall was Hikaru’s portrait, placed in a glamorous golden frame. Aoi was shivering as she stood upright, her back pressed against the wall; Kazuaki had a hand on Aoi’s chin as he turned his face to Koremitsu. Aoi called out for Koremitsu with tears in her eyes. At that moment, Koremitsu was already right in front of Kazuaki. ; he pried Kazuaki away from Aoi, and caused Kazuaki to fall onto the floor on the backside. He then kicked down the smoking stove, and opened the windows wide. Asai, looking on grimly, followed in after Koremitsu, and pulled Aoi to her side. Asai spoke with a comforting tone, hugging Aoi tightly. Hikaru’s tense face finally showed relief. Koremitsu stood tall, looking like he was protecting Aoi and Asai behind him with his back. His eyes were flaring as he glared at Kazuaki. Asai spoke harshly as she embraced Aoi. Kazuaki spoke in disdain, seemingly not realizing the gravity of his actions. Because of this, Koremitsu was seething more than before. Tōjō had said that Kazuaki was a member of the Udates. That the Udates had a shrine worshipping the spider. Kazuaki probably heard of the spider curse related to all the Udate women. And so, he became ‘Rokujō’. Why did Rokujō appear ‘now’, of all times? It was because due to Hikaru’s death, there was a vacancy for Aoi’s fiance. And because Aoi was starting to open her heart to Hikaru’s friend, Koremitsu. To Kazuaki, who was obsessed with Aoi, Koremitsu was an eyesore. That was why he tried to lure Koremitsu to another woman, and get Aoi to hate Koremitsu. At the garden party, he too set an elaborate trap to ensnare Koremitsu, and to misdirect Aoi. The modern spider’s reincarnation, the Rokujō Tsuyako so feared was this seemingly ordinary looking Kazuaki. He actually thought of pairing Tsuyako and Kazuaki together. He recalled himself boasting arrogantly to Hikaru that his love skill has improved by a little, that Hikaru should just stay back and watch; upon recalling it, he felt so sheepish he wanted to roll about on the floor. Kazuaki continued to insist shamelessly. It was unknown what exactly was he thinking. There was Hikaru’s portrait on the wall, Aoi’s personal belongings in the trashbin, and also, there was a pile of what seemed to be black animal fur. In fact, that was a wig. Koremitsu grabbed that wig, and threw it at Kazuaki. The pitch black hair flew in the air, landing right on Kazuaki’s head. The long black hair covered Kazuaki’s face loosely. With a sweet voice, Kazuaki cackled, causing Koremitsu to be shocked. Aoi, embraced by Asai, trembled; Asai too scowled in a terrifying manner. Hikaru watched this half-brother of his who so happened to have the same voice with a tense, stern look. Kazuaki did not take off the wig that was draped messily over his face, but continued to cackle while on the floor. He was not laughing because it was funny; it sounded as if he was mocking those he felt was more wretched than he was. The face was covered by the wig as he spoke with a rich, clear voice, sounding like a ghost hiding in the darkness. Rage was rising up within Koremitsu’s throat. He pulled down the black wig covering his face with his effeminate fingers. The narrow eyes were staring at Koremitsu alluringly. And at the next instant, Koremitsu’s face wrecked Kazuaki’s nose. The wig fell, and Kazuaki rolled back on the floor, his head hitting the wall, resulting in a tremendous thud. He covered his face with both hands, groaning. He probably was majorly affected by it as he covered his face with both hands, rolling about on the floor. Koremitsu did not pity him at all. Koremitsu took down Hikaru’s portrait along with the frame from the wall, tucked it under his armpit, and left the building with Aoi and Asai. The Asais’ vehicle was parked right in front of the door. Aoi was probably feeling afraid; her pale face remained lowered as Asai supported her out, closing her eyes from time to time, trembling. Koremitsu felt an aching in his chest. However, it was good that he managed to save Aoi without a hitch. 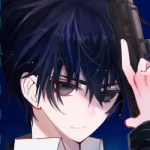 And then, once they got to the vehicle, Asai suddenly shot an unhappy, icy stare at Koremitsu. She spoke in a monotonous tone. Beat him…she wanted to beat Kazuaki up? While Koremitsu was feeling flabbergasted, Asai and Aoi got on the car. After frisking the portrait from Koremitsu quickly, she shut the doors, and the car departed. Koremitsu yelled in the midst of the quiet place, where the lush greenery grew. Honoka was in the hall, waiting anxiously for Koremitsu’s arrivial. She had been dialling Koremitsu’s number for some some time, but the phone was either cut off, or left at the voicemail; she was unable to get through to him. She hoped that Koremitsu would encourage Tsuyako before the latter would take the stage. In the rest lounge, she saw Tsuyako dressed in peasant clothing, a black wig on her head, her face painted snowy white. She had her head lowered in such a state. She looked extremely frail, fidgeting with her arms fold in front of her chest, switched about a few times, let out anguished sighs, bit her lips, and lowered her eyes. She sounded and looked so cheerful when they went their separate ways after school the previous days; it seemed she had completely cheered up then. What exactly happened with Akagi. There seemed something strange when she went back…did she say something to Akagi? Honoka felt extremely anxious, and recalled the conversation in the rest lounge. Tsuyako merely answered with such a stiff tone. Her face became glum as a result. Honoka did not know what was going on, but it seemed Tsuyako was waiting for Koremitsu to return. And thus, Honoka hoped that if Koremitsu could make it in time, she would drag him to the rest lounge immediately as she waited at the lobby. The recital however was about to begin. Michiru came over to call her in. Honoka looked back at the entrance, and trudged forth with heavy steps. Tsuyako’s hands were trembling in the rest lounge, devoid of anyone else. Just a while ago, Asai gave Tsuyako a call through the cellphone with an icy tone. She said that Aoi was safely recovered. From Asai’s voice, Tsuyako could feel the lashing that befits Asai. However, the fear Tsuyako felt because of Kazuaki was not something that could be removed so easily. Even after telling Koremitsu of Aoi’s location, Tsuyako was trembling all the way. She had the sensation of a spider scuttling all over her body once she thought of the punishment Kazuaki would inflict of her. Everyone else had assumed that Kazuaki was an ordinary, refined person, but that was not the real Kazuaki. Kazuaki’s real nature was that of an extremely persistent spider. Kazuaki’s mother and Tsuyako’s father were cousins, so when the Udates had a banquet, Kazuaki was brought along by his mother. To the adults, the older, feeble youth seemed to be a well-nurtured, honest, quiet child. And he would show a smile. Tsuyako was so shocked she could not let out a voice. –My hair is an ugly red rustic color. Kazuaki’s words echoed a few times deep within his ears, causing her to cover herself in the blanket, crying. She would try her best to avoid meeting Kazuaki. But at the year Tsuyako entered the affiliated elementary school of Heian Academy, she was betrothed to Kazuaki. Ever since then, it was hell for her. Every single time, Tsuyako’s chest would shrink tightly. She lowered her head, and removed her clothes, leaving only a thin, loose undergarment. Kazuaki put on Tsuyako’s dress, wore the hat, took a look at the mirror, raised the hems of the dress lightly, and spun around, looking extremely satisfied. He said these words and left the house in such a state. And so, the plucking the tulips at Aoi’s house was deemed to be Tsuyako’s prank. On that night, Tsuyako was scolded by her parents. It seemed the girl who plucked the tulips was dressed in a one-piece dress, wearing a hat, just like Tsuyako. No matter what I say, nobody will believe me. Once she had realized this, Tsuyako felt despair all over. She felt really lonely to be separated from her family, living alone in an English boarding school. Why was she the only one to have such unfortunate events? Tsuyako would often cry on the bed in her hostel. Am I rejected because my hair is a red rustic color? If I am someone with dry, smooth black hair, will everyone else accept me? She was able to return back during her summer vacations and Christmas period, but when Kazuaki saw that she had grown taller and bustier, he said with a devastated look. And from that day on, Tsuyako was often ordered by Kazuaki to hand her clothes over to him. He would always say such a thing. With such an appearance, he placed the rat carcass at Aoi’s house, and continued to pluck the flowers belonging to others unrelated. He answered with a sweet voice. Kazuaki narrows his eyes in delight, showing an icy smile by his lips. That expression caused Tsuyako to shudder. The Udates worship a spider. 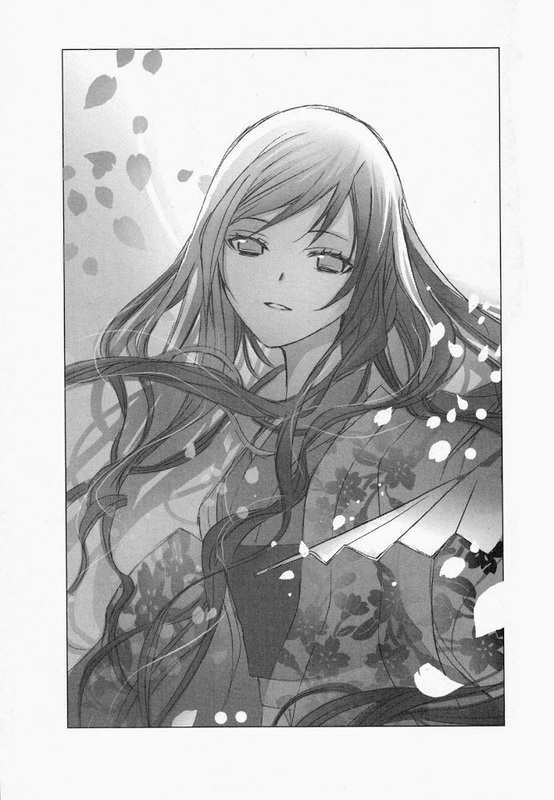 She felt as if the embodiment of ‘Rokujō’ was residing within Kazuaki, and felt the silver strands of the spider were ensnaring her neck, choking her. Even in England, she was unable to escape from Kazuaki. The threads Kazuaki let out often entailed her. That was once she felt. When she grew older, her classmates started talking about love. But when she saw them talk enthusiastically with blushing faces, Tsuyako’s mind was only filled with the damp, soft smile of Kazuaki. I am not allowed to love like everyone else. Once I return to Japan, I can only marry Mr. Kazuaki. I can never love in my life. Ever since this moment, she started learning the ‘Your Shadow’ style of dance from an assistant instructor who came to England. She studied it to learn some etiquette, but gradually came to love dancing itself. But even so, when the dance was about the topic of romance, she would feel her chest being stumped, her face would become glum, and her limb movements stiffen. Her instructor would often say this so casually. However, Tsuyako felt as if her heart was about to be ripped out. I never fell in love in my life. The future for her was so bleak, so dark, and whenever she did a romantic dance, she felt anguished. And just like this, when Tsuyako returned to Japan during her Spring park, she met Aoi at an evening garden party. She only saw her once or twice from afar when they were young, but it was the first time she saw the her after having grown up. Kazuaki had always praised Aoi’s elegant black hair surrounding that white, tender face of hers, and whenever Aoi moved, the hair draped down to her small breasts and her slender waist swayed about. Her eyes, nose and lips were so adorable like a doll. The adults surrounding Aoi watched her with an intoxicating gentleness. And due to her father’s words, Aoi’s raised her eyebrows. She said, and then argued with her cheeks blushing. Seeing Aoi like this was enough for Tsuyako to realize that Aoi really loved her fiance. As a result, she was no longer able to watch on any further. I am so jealous of Aoi! I am so jealous that she is able to fall in love with her fiance! So jealous of her because she is blessed by the people around her! Feeling a prickly pain all over, tears welled within Tsuyako, her throat nearly breaking apart. Her inner heart was writhing in pain, like she was being tortured, and she ran to a dim place devoid of anyone else. She saw a cherry blossom tree that was without any flowers, basking under the moonlight’s radiance, and the emotions that swirled within her rushed out. I am just like this tree. B-but, I too really wish to fall in love. Her tears nearly fell as she lifted her head, watching the moonlight appearing between the twigs. The shrouded moon was too tall, too far; the crude tree branches that had yet to bloom seemed so cold, so lonely. Tears welled in her further a she swayed about hazily. I want to have some romance, even if it is just once. I wish to be an important person to someone. If only the moon can take the form of a beautiful youth and descend upon me. If only he can embrace me. If only that happens, I can give up my life at that instant. With tears in her ears, Tsuyako hummed the song she learned during dancing class. Why would the god in the sky not descend upon me? Is it because I am an ugly girl with red rustic hair? That no matter how I pray, this fairy tale-like story will not befall upon me! At this moment, the cherry blossom branches rustled slightly, and appearing on the other side was a slender, pretty boy shrouded by the moonlight. He spoke with a rich, sweet voice. The voice seemed similar to Kazuaki, causing Tsuyako to tremble. At the same time, she recalled the half-brother of Kazuaki everyone was talking about. He had the exact same voice as Kazuaki, but was much prettier than the latter; he had clear eyes, a charm that caused many a woman to be infatuated with, a boy who goes about philandering. Is it this child? Hikaru Mikado–? Hikaru said that he was watching the flowers. Tsuyako said that the flowers were not in bloom, and Hikaru answered that they would bloom from today onwards, praising Tsuyako’s hair for being as pretty as the red weeping cherry blossom. From then on, Tsuyako felt that everything has changed. When time the red hair grew to below her breasts, she did not think that it was a red rustic color anymore, and did not hide herself as a result. It felt as if the strands binding her had snapped, and her limbs were able to move freely, her dancing improved to a point where even the instructor was amazed. The stares everyone give to Tsuyako too had changed. Hikaru allowed Tsuyako to bloom. As long as Hikaru remained around, there was nothing Tsuyako was afraid of. She was not afraid to do anything bold. Like the moon being shrouded by the clouds, so that the light dazzling in Tsuyako’s eyes vanish. And then, the spider, Rokujō, spoke softly to the perplexed Tsuyako. –Mother is the one who said to abandon the engagement, but I never remembered agreeing to that. If I can get Aoi, I do not need that red rustic hair of yours, Tsuyako. You are to help me. Lure in that shaggy dog called Akagi and pull him away from Aoi. You should be able to do this, Tsuyako. You are no longer a virgin after all. Tsuyako felt the blood freeze all over in her body, her body suddenly unable to move. The notion that she was able to escape from Rokujō’s clutches before this was completely wrong. Even till this point, she was trapped in the spider’s threads. She was unable to move her fingertips, her throat unable to call out, and her eyes were unable to look away; these were the facts that told her of this truth. Again Tsuyako was pushed into the abyss. She approached Koremitsu, and deliberately kissed him in front of Aoi at the garden party. On Kazuaki’s demand, she took off her uniform and handed it to him. The faint aroma remained on the returned uniform, and feeling repulsed, she scrubbed it with water quite a few times. On the day she went to the tropical botanical gardens with Koremitsu, her witnessing the spider reminded her to Kazuaki demanding that she remove her uniform in the clubroom. There was still a faint smell after he obtained Hikaru’s portrait and returned the uniform smugly. Tsuyako continued to sob as she wore the uniform and doused herself with cold water at the swimming pool’s bathroom. After that, Tsuyako apologized to Koremitsu a few times, for the latter showed concern for her. I am sorry, Mr. Akagi, sorry. Kazuaki’s obsession with Aoi was abnormal. –I want Hikaru’s most beloved. Kazuaki spoke with a demonic stare, his appearance vaguely human at best, an embodiment of the spider. Upon thinking about what sort of misfortune would occur to Aoi, Tsuyako felt her heart nearly cease. She cannot allow Aoi to fall into Kazuaki’s hands! She could not oppose him. She hoped that someone could notice his intentions. When she sent the message to Aoi using Koremitsu’s phone, she merely deleted Aoi’s reply when it came, leaving her original message behind. It was a bet on her part. The fact that Aoi refused the prior appointment with Kazuaki, and chose to go out with Koremitsu instead caused Kazuaki to be thoroughly infuriated unlike before. –This is unforgivable, Third Princess! That red wild hound is dating Aoi! –Aoi here is being too frivolous here. Hikaru has just died, and now she wants to approach another man. –And she despises me just like when we were young. –I only treated her kindly because she is Hikaru’s most beloved, cute, petite and has that unique black hair. This is vexing, Third Princess. –It is alright, I will not do anything too much. Aoi here is Hikaru’s most beloved. I will just place her in a pretty box and take care of her. I cannot wait till my graduation; I must make her my bride immediately. I am so looking forward to it, Third Princess. He showed such a demonic smile, sleazily petting the cage that had his pet chameleon inside. In the face of such a mystifying sight, Tsuyako barely managed to hold in her shrieks a few times. Could Aoi, sheltered by her parents and Asai, raised in a delicate environment, withstand such terror? Perhaps she would be toyed around by him, trodden upon. Hikaru’s most beloved flower would be ripped apart by Kazuaki. –Please, Mr. Akagi. Notice this. Tsuyako told herself that she could no longer get Koremitsu involved in this. However, as Koremitsu called him ‘senpai’ with an earnest look, she inadvertently wanted to plead him for help, and earnestly prayed. He managed to decipher the words from Tsuyako, ensnared in her fear of Rokujō, and saved Aoi. The girl Hikaru chose at the end would not have to be Rokujō’s sacrifice. Even when she tried to stop, her fingers kept shivering. Her body felt heavy, as if tied down to the floor by strings. She inadvertently thought about Kazuaki–Rokujō. ‘That red rustic hair is so ugly’ the sweet voice echoed deep within her ears, never vanishing. Before she danced on stage, Hikaru would do a spell on her. He would gently raise Tsuyako’s hand, and draw a circle on her palm using his slender, white finger. –Now everything will be alright. The moon will not be shrouded by the haze. It will continue to shine above you. He would show a gentle smile. And a sweet, gentle voice that would enter her ears smoothly. And as he always said, Hikaru would often appear in the audience, shining upon Tsuyako whenever the latter danced. Praising her more than anyone else. The world without Hikaru was so dark, lonely, and she could not dance. Tsuyako slowly got up, and walked to the stage. The lights, when viewed from the side of the stage, was so bright. The young girls were dressed in yellow kimonos, looking like field mustards as they danced cutely. But to Tsuyako, it seemed as dark as a moonless night, causing her limbs to shrink back. The spiders were crawling out from the darkness. They scampered across the stage in droves. I cannot dance at all. She was taken aback upon hearing this voice. She should be dancing and appearing on the stage once the verse ends, but she missed the timing. Tsuyako hurried onto the stage. The more anxious she was, the heavier her body got. The trembling in her fingers did not stop. The two levels of audience seats were already filled up. But Hikaru was not there. The gentle moon shining upon the stage was no longer rising. At that moment–the door at the 2nd level audience opened, and a boy barged in. He was probably very anxious. His slightly curved shoulders were quivering in pain. The sharp ends of his red hair was ruffling wildly. Tsuyako’s stare was directed towards the boy. The boy walked down the aisle, arrived at the front of the balcony, and waved his right hand high at Tsuyako while the latter stood blankly on the stage. The stiff face, unhappy scowl appeared as a fresh image in Tsuyako’s mind. The messy red-haired youth with a sharp expression was Hikaru’s crude, honest, straightforward friend. –I’ll be here before your performance begins. He said this, and darted out. –I’ll definitely come by to watch your performance. He told her with a clumsy tone. That boy raised his hand up, made the gesture of someone holding a pen, and slowly drew a large circle. He drew a round moon in the audience. –Senpai, you’ll be the one who’ll move the audience most tomorrow. –I’ll watch in the audience with my eyes wide, in place of Hikaru. The clear moonlight shone in from between the clouds, raining silently, creating a gentle light in the dim space of black. A weak light too shone into Tsuyako’s heart. Hikaru’s friend, so different in terms of face and personality, drew a moon in place of Hikaru. It was a hazy moon giving off a faint light, floating in the night sky! Her body suddenly became light, and she naturally began to dance. The moon in the night was lured by the cherry blossom petals to the village girl out in the wild. The girl happily received the cherry blossom petals fluttering down with her palms. The innocent girl had yet to learn about love. Narihira, who came from the capital, appeared in front of such a girl. The girl fell in love immediately with this trendy prince with a gentle expression. She continued to dance elegantly, ostensibly drunk in her first love. Moving her toes just as if she was gliding on the floor. Shyly tilting her neck, shoulder. 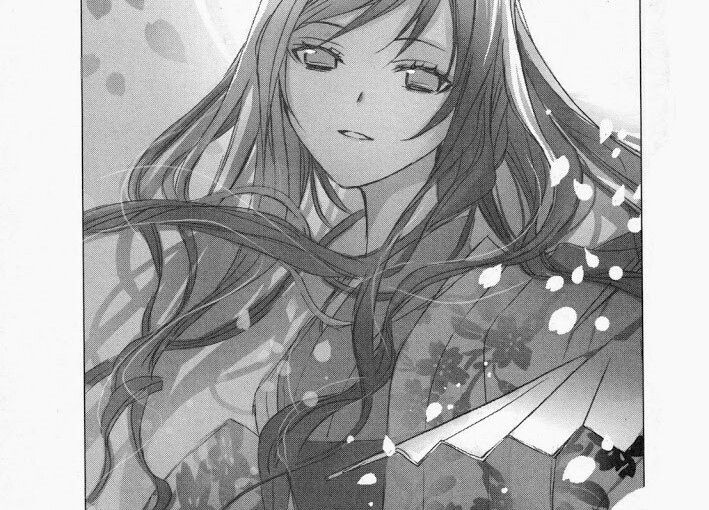 The fingertips were grabbing the collar of her kimono slightly, showing a gentle, quiet moonlight. She, having learned of what love was, was utterly elated. She was truly chuffed to have fallen for such a beautiful, noble man. With such a delighted feeling, Tsuyako smiled at the audience. The boy standing in front of her was the one who came to fulfill Hikaru’s promise. Above the serious, earnest him, there was a vague sight of Hikaru smiling gently at her, and deep within her ears, there was a rich, sweet voice. –Hey, Tsuyako. There will definitely be a lot of people who came from afar to watch you. They will be mesmerized by your actions, like how the flowers sway, how the branches move, sighing in amazement. You are the most beautiful flower in the garden. The clear moonlight shone gently upon the lonely tree without flower, muttering with a radiant voice, ‘The flowers will bloom one day’. At this point, that moon is shining upon Tsuyako. Blessing its clear light right above her. This was what Hikaru’s friend told her. That her promise with Hikaru was still continuing. Koremitsu stood at the balcony, watching Hikaru’s ‘flower’. She twirled her arms, swung her hands in an adorable manner, showing a smile on her lips as she revealed a bashful look. She looked just like a 14-15 year old innocent girl, captivating people to the point of them being unable to look away. Hikaru too stood beside Koremitsu, watching Tsuyako dance, narrowing his clear eyes with ecstasy. Whenever she raised her arms, tilted her neck, took a step forth, she would always think of Hikaru. She would think of the happiness he brought her. She would think of the love he brought her. –The flower has yet to bloom. –It will bloom tonight. The most beautiful cherry blossoms who bloom on this branch. These are the cherry blossoms I see. Ah, they are so beautiful. I am looking forward to seeing them. –Your hair is really red and pretty. If you leave it long, it will be like the red weeping cherry blossoms. I really want to see them. Tsuyako was not Hikaru’s most beloved. But that did not matter to her. What she could be sure of was that Hikaru did love her before. On the evening of their meeting, Tsuyako was earnestly hoping for love, to the point where there was practically a mark etched on her chest, and Hikaru himself fulfilled this wish of hers. How many girls exactly have had such love? Who exactly allowed themselves to experience such a fast-beating heart, dizziness and delight. Tsuyako lifted her head and looked up at the shrouded moon appearing in the audience, not pleading feebly this time, but calling with an alluring smile. She opened her faint red fan, fluttering gently in front of the faces. The spring pixies danced about, putting new clothes upon Tsuyako from behind, removing her wig. The plain village girl outfit was replaced by the long-sleeved golden red luxurious clothing littered with cherry blossom patterns. The hair combed upwards was undone, becoming red like a cherry blossom, scattering upon the breasts and back with gloss. The ordinary village lady became the spirit of the cherry blossom, the queen of Spring. The audience let out a huge cry of amazement, stares of praise raining upon Tsuyako. At that instant, the moonlight fluttered into Tsuyako’s heart. Hikaru had descended upon Tsuyako’s heart. He was smiling in her heart, whispering in her heart, breathing in her heart. –The floral language of the weeping cherry blossom is that of an outstanding person. –It really suits you, Tsuyako. Tsuyako felt the sweet sensation and agony of blissfulness all over her body, and embraced them fully. For there will be heart-wrenching events loneliness and agony in the future. For there will be moments where she looks up at the moon alone, weeping as she thinks about Hikaru. However, she has to remove her tears in front of others, showing a beautiful smile. For I am the most beautiful, dignified flower in the garden. And I shall continue to be that flower. The beauty was something everyone else has to marvel at, such elegance, allure could even reach a distant place. The name of the owner who caused such a flower to bloom would be greatly praised. She wanted to be such a beautiful flower–a flower who cannot be violated. Tsuyako’s appearance was to end. The moonlight became dim, and Hikaru vanished from Tsuyako’s heart. She felt lonely, really lonely. It felt as if her chest was being wrenched. But even so, she was no longer afraid of the clouds and darkness that shrouded the moon. For she knew that on the other side of the thick clouds, the moon would be shining no matter what. The boy caused this tree, once devoid of any buds, to bloom red flowers. Her eyes were becoming blurry due to her tears as she whispered this to the boy. It seemed she heard a gentle farewell before the curtains fell. It is a really tough thing to keep to a promise, Koremitsu. My feelings when I make them were sincere, and I truly believed I could fulfill them. At the moment I made a promise, I felt as if I had connected with the girl’s heart. She would then be embarrassed, smiling at me happily. I really like this sacred and blissfully sweet feeling. But there are some moments where I could not fulfill the promises I could have made. Eh? ‘You make too many promises’? ‘Don’t make any promises for everything. Try thinking about me when I’ve to go about fulfilling your promises’, you say? Yes, I have caused you to suffer all this while. It is not just about Tsuyako; both the matters of Miss Aoi and my older brother are beyond my expectations, to a point where my heart nearly broke a few times, given that it should not be moving. If anything had happened to Miss Aoi, I probably would have regretted to the point of not departing to the afterlife. It is really great that Miss Aoi is alright. After that, you ran all the way to Tsuyako as fast as you can. You were abandoned at a place even the trains and buses do not appear, and even when trying to hitch a ride, your face looked as scary as someone who just murdered a person, so no car was willing to stop. You then got in front of a car and forced it to stop; at that moment, I thought of the moment where I first met you. Like back then, you never thought about yourself at all, always going forward for the sake of others. Am I able to fulfill my promise with Tsuyako? I feel that the answer is on that stage. The serious expression you showed, the large moon you drew at the balcony; after all that happened, Tsuyako was suddenly full of life, and started dancing radiantly. That is because you gave Tsuyako the moon in place of me. It is a moon bigger than mine, one that will continue to shine for eternity. Tsuyako was once my ‘pride’. I was always mesmerized by her radiant smile, dazzling lively eyes, elegant arm movements, and the red hair that drapes down. Just looking at her dance was enough for anyone to straighten their backs, their souls seemingly floating in the air. How can such a beautiful girl ever exist? The girl who yearned for love when we first met had bloomed into such a wondrous flower. To Tsuyako, who smiled and concluded that she will never exchange her fate with Miss Aoi, I am truly proud of her. Tsuyako never compared herself with others. And she never was envious of what others had. She accepted the risks and anguish that came with freedom, looking forward positively. There were times where I felt of cursing my fate, and whenever I did so, I felt despair over how small, how powerless I was, wandering about in a dark maze. Should I really be allowed to born? Was it really a mistake right from the beginning? I would have such pessimistic thoughts just like that. But whenever I saw Tsuyako, as dignified as the red weeping cherry blossom, I felt that I too have to proceed forward. I felt really happy when I shared secrets with Tsuyako in the Japanese Dance clubroom, when we embraced each other, kissed each other. We did lots of things together, whether they were terrifying or bad. She is the best lover. Tsuyako said that her encounter with me caused her to change, but her might is something she earned through her hard work. Thus, it did not vanish because of my death. As long as she continues to dance, Tsuyako will definitely realize it, even if it is a matter of time. And then, everyone will flock by from afar to watch Tsuyako. They will show amazement at the red weeping cherry blossom that sways, the sight of the flowers scattering, and summon their courage. Tsuyako’s beauty shall be praised and become widespread. If possible, I really wish that I am still alive and introduce you to Tsuyako through my own word of mouth, Koremitsu. To introduce the friend I am so proud of, as the lover I am so proud of. I feel that Tsuyako gets along surprisingly well with you, in terms of boldness, the might of being undaunted by what others say, and the devotion to those important to you. Tsuyako is one who often likes to smile, so if you two are together, you might be affected by her, and able to smile too. Now then, if you can talk about me with Tsuyako after I am gone, and remember me, I will be delighted. I too will continue to watch Tsuyako dance; no matter where the place is, what the place is, I shall applaud her all the way. I am currently on this land. One day, I shall be in the distant sky. If both of you, who I truly love, are able to laugh every single day, my heart will be filled with relief and delight even when I am floating alone in space. Perhaps I will be able to endure my loneliness. anyway, it seems koremitsu was left behind. I wonder how long its going to take him to get back. p.s. gud job, almost done with the volume. Yay, Volume 4 almost over. thank you for the translation translator. Argh. That Kazuaki. Thank you for the translation so far! Aah!! Koremitsu should given that Kazuaki more than one punch. lol Koremitsu should punch Kazuaki like 4-5 times. One for Aoi, one for Tsuyako, one for Hikaru and the last one for Asai i guess. Uhh, did Hikaru just admit that he and Tsuyako did it in the clubroom at school?